I am happy that I took the time to become acquainted with this book. The text is well thought out which makes the book interesting and easy to read. 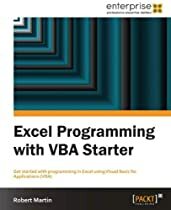 This is an excellent way for people to approach Visual Basic for Applications (VBA) within the Context of Microsoft Excel. All the key points are demonstrated with code examples. These examples are set for Excel 2010. Great for beginners but if you're looking to learn find something with more substance & pages than this. As purely an exercise to introduce the topic it gets the job done.